Welcome to www.ohmyprintsolutions.com (the “Website”). The Site is operated by Oh my Print SolutionsInc. . The products or services provided by Oh my Print Solutions Inc. on the Website or in connection with the Website (the “Services”) are provided to users of the Website (“You” or “you”), individually (or, if you are using the Website on behalf of an organization, the organization), subject to the following terms and conditions (the “Service Terms”). Please read these Service Terms carefully before accessing or using the Services. By clicking a box that indicates you agree to the Service Terms, or by otherwise accessing or using the Services, you agree to be bound by these Terms. If you do not wish to be bound by these Service Terms, please do not access or use the Services. Oh my Print Solutions Inc. reserves the right to change the Website or the Service Terms at any time without any notice to you. You may be asked to register with the Website in order to use the Services, and Oh my Print Solutions Inc. will provide you with a username and password for the Website. You are responsible for maintaining the confidentiality of your username and password, and you accept responsibility for all activities incurred under your username and password. You will notify Oh my Print Solutions immediately of any unauthorized use of your account or any other breach of security via our contact page. Provided that you continue to comply with these Service Terms, Oh my Print Solutions Inc. grants you a personal, non-assignable, and non-exclusive license to access and use the Website, upload content via a link from a third party (“Your Content”), access content made available by Oh my Print Solutions Inc. on the Website (the “Website Content”), and create and submit orders (each an “Order”) for products and services available on the Website. No other download, retention, use, publication, or distribution of any portion of the Website Content is authorized or permitted. Other than with respect to Your Content, you are not entitled to use any portion of the Website Content, other than on the paper products produced by Oh my Print Solutions Inc. in accordance with your Order (the “Products”). Except as expressly provided herein, you may not use the Website to engage in any unlawful activity or to infringe Oh my Print Solution’s rights. You further agree that you will, and you will not allow your employees or agents, as applicable, to: (a) modify, republish, upload, post, transmit, sell or distribute in any way the Website Content, without the prior written permission of Oh my Print Solutions Inc. ; (b) translate, reverse engineer, decompile, disassemble the Website Content; (c) remove any proprietary notices or labels on the Website Content; (d) violate, plagiarize or infringe on the rights of any third party, including copyright, trade-mark, privacy or publicity, contract or other personal or proprietary rights; (e) interfere with the operation of the Website, in any way or interfere with anyone’s use or enjoyment of the Website or use the Website to gain unauthorized access to other computer systems; (f) transmit any unlawful, harassing, libellous, defamatory, abusive, threatening, or harmful material of any kind or nature or transmit any material that encourages conduct that could constitute a criminal offence, give rise to civil liability, or otherwise violate any applicable local, provincial, state, national or international law or regulation; (g) impersonate any person or entity on or through the Website; (h) post any content that may be considered threatening, abusive, vulgar, obscene, or otherwise objectionable (i) copy, reproduce, modify, sell, lease, scrape content from or aggregate, sublicense, market, or otherwise change or commercially exploit in any way the Website other than as may be expressly permitted in writing by Oh my Print Solutions Inc. or as permitted pursuant to any fair use, fair dealing, or similar provisions of applicable laws. You agree that any copy of the Website or the Website Content which you are permitted to make under the Terms shall retain all copyright and other proprietary notices in the same form and manner as on the original. You are solely responsible for Your Content, including, without limitation, in combination with any other images, graphics, text or other materials, including any Website Content, you incorporate into the Products. You agree that you will not include any text, image, design, trade-mark, service mark, or any copyrighted work of any third party in any of your Orders, unless you have obtained the appropriate authorizations from the third party owners. You represent and warrant that Your Content does not infringe upon any rights of any third party, including, without limitation, rights in copyright, trade-mark, and publicity or privacy, and Your Content will not libel or defame any third party, and that you have all required rights or permissions necessary to incorporate Your Content into the Products. By placing an Order, you represent and warrant that you have all necessary permission, right and authority to place the Order and you authorize Oh my Print Solutions Inc. to produce the Products on your behalf. Oh my Print Solutions Inc. does not claim ownership of Your Content. However, by submitting your Content, you grant to Oh my Print Solutions Inc. , its affiliates, and sublicensees a royalty-free, perpetual, irrevocable, transferable, worldwide non-exclusive right to use or incorporate Your Content (in whole or in part) for the purpose of producing the Products. We may use your printed complete products on our social media platforms, and website, unless you express in writing that you do not wish to partake in that program. You also represent and warrant that the holder of any rights in Your Content, including any moral rights, has completely and effectively waived all such rights and validly and irrevocably granted to you the right to grant the license stated above. Subject to these Service Terms, the owner of Your Content retains any and all rights that may exist in such content. The copyright to the Website, the design and appearance of the Website, and all of the material and the Website Content, other than Your Content, are owned by or licensed to Oh my Print Solutions Inc. This material is protected by law against unauthorized copying and reproduction. Any use, reproduction, or distribution of the Website Content, including caching, framing, or similar means, from the Website or reproduction, distribution, use of any templates (except as permitted herein), without permission of Oh my Print Solutions Inc. is expressly prohibited. “Oh my Print Solutions Inc. ” and other Oh my Print Solutions Inc. graphics, logos, publication designs, and service names are trade-marks of Oh my Print Solutions Inc. or its affiliates or associates. All other trade-marks not owned by Oh my Print Solutions Inc. or its affiliates that appear on the Website are the property of their respective owners, who may or may not be affiliated with, connected to, or sponsored by Oh my Print Solutions Inc. or its affiliates. The display of any trade-marks on the Website does not imply that a license has been granted to you or any other party for any further use. (a) Colour Shift: You acknowledge and agree that Oh my Print Solutions Inc. will not be responsible for any colour shift that occurs in conversions from RGB to CMYK or PMS Pantone colours to CMYK colour modes. There are no refunds for colour shifting however we may, at our discretion, do a reprint at a reduced rate if the new files are submitted to us. All artwork, designs and images provided by you to Oh my Print Solutions Inc. for incorporation into any Products must be provided with a minimum of 150 DPI for large format print. Oh my Print Solutions Inc. is not responsible for the degradation in quality of the images printed, including fuzziness, distortion, pixelation, or any other type of degradation from the provided artwork, designs, and images when such degradation is caused by the nature of artwork you provided to Oh my Print Solutions Inc, including, without limitation, where the image has a resolution that is lower than 150 DPI. Oh my Print Solutions Inc is not responsible for any colour shift in converted photographs with black, near black, or grey tones. Oh my Print Solutions Inc. will use commercially reasonable efforts to match the colours in the artwork to the Products. Templates/Online Templates: Oh my Print Solutions Inc. will not be responsible for your use of outdated templates. Before making an Order, you represent and warrant that you have downloaded and used the latest version of Oh my Print Solution’s templates from the Website. The templates made available to you by Oh my Print Solutions Inc on the Website are designed specifically for use with the Website and Oh my Print Solutions Inc. and not for any other purpose. In the event you wish to make changes, alterations, or modifications to the free templates, you will be responsible for any such changes, alterations, or modifications, including using a professional designer for such purpose. For your convenience, we can recommend professional 3rd party graphic designers. Oh my Print Solutions Inc is not affiliated with the designers in any manner, and Oh my Print Solutions Inc is not responsible for any errors, issues, or other problems caused by the work of such designers. (e) Colour Proofing & Ink Matching: Oh my Print Solutions Inc. is not responsible for matching colour or ink density on the Products to the artwork. While artwork will predict design layout, text accuracy, image proportion and placement, they cannot be used to assess colour or ink density in the Products. You acknowledge and agree that the artwork do not show transparency and over print issues, and they do not reflect colour change from RGB to CMYK. You acknowledge and agree that Oh my Print Solutions Inc. may produce the Products with other products ordered by other customers, and as such, there may be deviation in colour or ink density in the Products when compared to the artwork.Oh my Print Solutions Inc. accepts no responsibility for colour variations between submitted images and the actual artwork or product they represent. Oh my Print Solutions Inc. does not print using pantones or specialty inks, as it only uses CMYK to process print jobs. We encourage you to send us your pantone code and we will make every effort to colour match to the CMYK platform. Oh my Print Solutions Inc. is not responsible for colour errors found in the artwork, and Oh my Print Solutions Inc. does not represent or warrant to consistent colours on the Products when compared to the artwork. Application of coatings may affect or change the appearance of the printed colours on the Products. (f) Order Approval: You are responsible for reviewing each Order and the artwork provided to you prior to making an Order. Oh my Print Solutions Inc. will not accept changes to Orders you have placed. In the event you accidentally made an incorrect Order, including, without limitation, the uploading of the wrong file, Oh my Print Solutions Inc. may charged a fee, to bear the cost of the initial Order as Oh my Print Solutions Inc. may have already processed the Order and began production. In the event Oh my Print Solutions Inc. already started production of the Products, Oh my Print Solutions Inc. , in its absolute discretion, has the right to reject any re-submissions. Where you fail to review the Product Proof and ask Oh my Print Solutions Inc. to print the Products without review or approval of the Product Proof, you will do so your own risk, and Oh my Print Solutions Inc. will not be responsible for any errors, problems, or other issues with the Products where the Product Proof has not been reviewed. Oh my Print Solutions Inc. does not always send a digital proof, unless specifically asked by the client to view one before printing. Oh my Print Solutions Inc. has no responsibility to re-print any Order if flaws, errors, or problems are found in the Product Proof after initial production. Notwithstanding any of the foregoing, Oh my Print Solutions Inc. is not responsible for any errors in a Product caused by any of the following reasons: misspelling, graphics, bleeds, grammar, damaged fonts, punctuation, wrong cuts, incorrect or missing folds, die lines, crop marks, transparency, overprint, incorrect colours, finished size of the Product, insufficient safe margin Oh my Print Solutions Inc. does not represent or warrant to the exact quantities of any Order, provided however that quantity deviation will in no event exceed 4% of the amount specified in such Order. Oh my Print Solutions Inc. does not represent or warrant that the Product produced on a re-order will be identical to the Products produced under the original Order. (g) Order Cancellation: You cannot cancel or modify any Orders after the Order has gone into production, and Oh my Print Solutions Inc. has no responsibility for any refunds for any Orders once the Order has gone into production. Oh my Print Solutions Inc. is not responsible for any duplicated orders that are placed on the Website as a result of your mistake. (h) Timing: There are several timelines available for different products we have on order. While we make every effort to make any client deadlines needed by the client we offer no warranty or refund for any late orders due to production or shipping challenges. (i) Warnings: Oh my Print Solutions Inc. sends out warnings before emailing proofs, about potential problems that may occur during printing. These messages are sent during the proofing process and it is your responsibility to read these warnings before accepting the proof. If you accept the proof without changing these potential problems then Oh my Print Solutions Inc. is not responsible if this error(s) occurs during printing. A reprint will not be honoured in such situations. Some of the most come warnings are: text too close to edges, borders, fraying of cards when dark colours are used, low resolution and colour matching (most common ones are: blood red, navy blue and specific greys). (j) Reprints: A reprint will only be honoured if a printing error or shipping error occurs. The exact same file will be used for the reprint process. If a client requests to change their file, this will be considered a new order. Any design errors will not be given a reprint as it is the responsibility of the client to look over their artwork before approving it to print. “File error” and other warning messages are sent out for this reason. If the client decides to proceed with an order without changing their design, then they take complete responsibility if such error occurs. The only way a reprint will be able to be considered is if Oh my Print Solutions Inc. (1) 5% of the finished product is return with the same printing error on all the card or (2) a claim is granted by Oh my Print SolutionsInc. ’s shipping provider for any lost or damaged package(s). It is in the sole discretion of Oh my Print Solutions Inc. to request more than 5% of the order, including the whole order, if the entire order needs to be reprinted. Reprints will only be honoured if a request is submitted within 7 business days after receiving your product. Reprints for shipping errors will take two weeks before getting approved or declined as shipping claims take two weeks to be processed. If a reprint is being shipped out for a second time and the price of shipping exceeds 20% of the product cost before taxes, then the customer must pay for 50% for the shipping cost. Customers will have to pay for shipping in full when an order has been shipped out more than twice. (k) Design Orders: Design quotes are based on the estimated time it will take to complete. In some cases, this time will be over or under estimated; however, the price will remain the same once the design quote has been accepted by the customer. A design service does not include the printing price unless stated. A design order will be completed once you have accepted your design proof. If you are unhappy with the finished design(s) then another design quote will be sent out for any changes that Oh my Print Solutions Inc. needs to make. If the changes are minor, and if Oh my Print Solutions Inc. has not gone over their estimated time to complete such design, a change may be made with no additional fee under the discretion of Oh my Print Solutions Inc. . A DESIGN ORDER CAN NOT BE CANCELLED OR PARTIALLY REFUNDED ONCE THE FINAL DESIGN HAS BEEN SENT TO THE CUSTOMER. If you decide to cancel a design order after being paid for and before being completed, then you will need to pay for services rendered, which is a minimum of $40 per hour with a 1 hour minumum. If no design work has been done when an order is cancelled, then the customer will only need to pay a 5% transaction fee on the price of their order, if cancelled later then the date of purchase. (l) Finished Product: Oh my Print Solutions Inc. will not offer a reprint or compensation if less than 5% of the product quantity is missing or defective. This is because specific bindery services can damage products, limiting the number of the finished product. For orders that have been selected as “pick up”, the customer will need to pick these orders up within 3 months of the order being ready. Due to the large volume of products and limited inventory space, materials may be removed and recycled after this time. (m) Sale Items: No other promotions, promo codes, in-store credits, sponsorship discounts or other discounts can be used on sale items. All files for sale item orders are required within one week (7days) from the date the sale expires, unless otherwise stated. If files are supplied after this time, the customer will need to pay the regular price of the cards as it is listed on the website for the same product. For regularly priced cards, customers will have 2 weeks to upload the files. If the files are uploaded after this time then the person will need to pay the price of the items as listed on our website. Sale prices can only be honoured during the designed sale time. Products placed before the sale date can only be honoured during the sale if the order has yet to go into “prepress”. If the order is in “prepress”, or has previously been in prepress, than the sale price can not be honoured. (m) Saved Designs: Due to the large volume of files received, Oh my Print Solutions Inc. does not save files internally. Files attached to orders will be removed 3 days after the file is uploaded. For designs that Oh my Print Solutions Inc. creates, files may be able to be found on internal hardware, but this cannot be guaranteed. All customers are responsible for saving all completed designs on their computers. (n) In-Store Credits: An in-store credits can be offered only if an order is cancelled before being put into “prepress” – to avoid cancellation fees- or may be offered as a form of compensation. The amount of compensation is solely based on Oh my Print Solution’s discretion. An in-store credit will not be issued for any order that was paid for using an existing credit; however, the order may qualify for a reprint, but only at the discretion of Oh my Print Solutions Inc. .
To claim an in-store credit a customer must supply their previous order number that the compensation was meant for. This is the only way the compensation can be confirmed by Oh my Print Solutions Inc. . Emails will not be sufficient enough to validate an in-store credit. Promo codes with be generated for customers to redeem their in-store credits. Promo codes will only be valid until their expiry date. When an order is cancelled, or compensation is given, a promo code will be sent to the customer’s account email (or the email that is on the order being compensated if the customer does not have an account). In-store credits are valid for a maximum of one year from the date the promo code is issued. If a customer does not use their credit within the year, or has only used a portion of it by the expiry date, the remaining amount will be forfeited. Oh my Print Solutions Inc. requires a 50% deposit to process any Orders. Processing of an Order will not start until you have made payment with a valid credit card number, company cheque, cash or Pay Pal. Oh my Print Solutions Inc. will not be liable for any of delay in completing Orders due to your delay in payment. (a) Pricing: All prices listed on the Website are in Canadian funds, unless otherwise noted, and are subject to change by Oh my Print Solutions Inc. without any notice to you. Applicable taxes and shipping and handling charges; if applicable, will be added to each invoice. Oh my Print Solutions Inc. may change pricing options as well as change any promotional offer(s) at any time without prior notice. (b) Pricing/Promotions: General pricing and promotions are in effect only for the regions and time periods as specified on the Website. Under no circumstances can you request alternate pricing options other than those available in specified regions. In determining pricing, Oh my Print Solutions Inc. uses your region of origin, and you may be required to provide proof (either shipping address postal code or promotional code) indicating your region of origin. Upon Oh my Print Solution’s satisfaction of your region of origin, you may request Oh my Print Solutions Inc. to send the products to a region other than your region of origin. Oh my Print Solutions Inc. reserves the right to match prices only at our discretion, We may not be able to match every price, but we will do our best. Price match is only honoured prior to placing an order. Under no circumstances does Oh my Print Solutions Inc. price match companies or competitor coupons outside of Canada. (c) Taxes: Any Order which specifies delivery of shipment in Canada is subject to Goods and Services Tax and may also be subject to Provincial Sales Tax. (d) Shipping Outside Canada: Any Order which specifies delivery of shipment of Products outside Canada may be subject to import taxes, customs duties, and fees levied by the country where the recipient receives shipment of the Order (“Import Fees”). You are responsible for all such Import Fees and any additional charges for customs clearance. Oh my Print Solutions Inc. has no control over these charges. Customs policies vary widely from country to country; you should contact your local customs office for further information. You will defend, indemnify and hold Oh my Print Solutions Inc. , its directors, officers, employees, agents, partners, suppliers and licensors harmless from any third party claim or demand, including reasonable attorneys’ fees, relating to or arising from (a) the submission and use of Your Content; (b) your use of the Services and activities occurring using your account information; (c) any violation by you of these Service Terms; or (d) your violation of any third party rights. This obligation will survive the termination or expiration of these Service Terms and your use of the Services. (a) Free Shipping*: Oh my Print Solutions Inc. uses the term “Free shipping to most places worldwide” Most prices you see on the website include the cost of shipping factored in already. Oh my Print Solutions Inc. has the right to refuse to accept an order or to ship if we deem the shipping cost worth more than the incoming amount of money from you, the client. This may happen in remote and rural areas and certain countries. We may only ship to one location for free per order. (b) Order Shipping: Oh my Print Solutions Inc. will use commercially reasonable efforts to ensure that production difficulties with respect to any Order do not delay delivery schedules. Oh my Print Solutions shipment and delivery dates are calculated based upon estimates provided by Oh my Print Solutions Inc. ’s logistics partners. 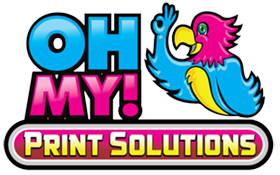 Unexpected failure, malfunction and/or technical problems with Oh my Print Solution Inc. ’s printing suppliers may delay Oh my Print Solutions Inc. ’s production process. In the event of such delay, Oh my Print Solutions Inc. may, in its discretion, refund or waive any rush fees applicable to an Order. Oh my Print SolutionsInc. can only use its own shipping account and will not use account numbers provided by you for any couriers. (c) Incorrect Address: You are responsible for providing Oh my Print Solutions Inc. with the proper shipping address. When a package is not delivered due to an error made by the customer in submitting the proper shipping address, Oh my Print Solutions Inc. will reship the package with the correct address and charge you an additional shipping fee. Product deliveries are subject to the corporate policies of the delivery companies used by Oh my Print Solutions Inc. . Policies regarding signature of delivery receipts will apply to you. If you are not present at the delivery location that you provided to Oh my Print Solutions Inc. , you will be responsible for picking up the package in accordance with the policies of the applicable delivery company. (d) Estimated Completion Times: When you place an Order using the Website, Oh my Print Solutions Inc. will provide you with an estimated date of completion of the Order. You acknowledge and agree that the date is an estimate only, is provided to you, and does not include shipping time for the Product. Oh my Print Solutions Inc. does not represent and warrant that your Order will be completed by the estimated date, except where you select the option of “rush printing”, provided, however, that in no event will Oh my Print Solutions Inc. be responsible for any delay in shipping of products caused by the shipping company, even where “rush printing” was selected. (e) Transfer of Title: You acknowledge and agree that the shipping terms for all Products from Oh my Print Solutions Inc. are FOB shipping point and ownership transfers to you upon delivery of your shipment to the delivery company. You assume all associated risks at that point, and Oh my Print Solutions Inc. will not be responsible for any loss or destruction associated thereafter. (f) Pick-ups: When picking up an order at one of Oh my Print Solutions Inc. ‘s location, transfer of ownership will occur once the customer has left Oh my Print Solution’s location. Any damage to the product that occurs outside of Oh my Print Solution’s location – including staining, ripping, bending or chipping – will not the qualify for a reprint. (g) Timing: While every effort is made to ensure your product arrives in a timely manner, at no time will Oh my Print Solutions Inc. be responsible for situations outside of their control such as late shipments, late arrivals, and missing and damaged items. It is recommended that the client orders with as much time as possible in advance to avoid such circumstances. It is the responsibility of the customer to pick up their order(s) from Oh my Print Solutions Inc. ‘s location on a timely basis. If an order is not picked up within 1 month of the purchase date then the order may need to be disposed of due to space restrictions, and the order will not qualify for a reprint. (a) Except as otherwise expressly provided herein, you acknowledges and agrees that the Website, the Services, and the Products are provided on an “as is”, “without any warranties”, and “without any liability” basis, and you and Oh my Print Solutions Inc. both acknowledge and agree that this limitation on liability is reasonable in the circumstances. (b) OH MY PRINT SOLUTIONS INC. DOES NOT REPRESENT, WARRANT, OR GUARANTEE THE QUALITY, ACCURACY, COMPLETENESS, OR TIMELINESS OF THE PRODUCTS, THE WEBSITE, THE SERVICES, OR THE WEBSITE CONTENT PROVIDED IN CONNECTION THEREWITH, WHICH MAY CONTAIN ERRORS. YOU SHOULD NOT ASSUME THAT YOUR USE OF THE WEBSITE OR THE SERVICES WILL BE ERROR FREE OR THAT THE WEBSITE WILL OPERATE WITHOUT INTERRUPTION. OH MY PRINT SOLUTIONS INC. DOES NOT WARRANT THAT THE WEBSITE, ITS SERVERS, OR ANY COMMUNICATION ORIGINATING FROM THE WEBSITE OR OH MY PRINT SOLUTIONS INC. ARE FREE OF VIRUSES, TROJAN HORSES, OR OTHER HARMFUL COMPONENTS. (c) OH MY PRINT SOLUTIONS INC.DISCLAIMS AND EXCLUDES TO THE MAXIMUM EXTENT PERMITTED BY APPLICABLE LAW ALL WARRANTIES, REPRESENTATIONS, AND CONDITIONS REGARDING USE OF THE WEBSITE, THE SERVICES, OR THE PRODUCTS, INCLUDING ALL IMPLIED WARRANTIES OR CONDITIONS OF MERCHANTABILITY, DURABILITY, MERCHANTABLE QUALITY, FITNESS FOR A PARTICULAR PURPOSE, OR NON-INFRINGEMENT, WHETHER EXPRESS OR IMPLIED AND WHETHER ARISING FROM A COURSE OF DEALING, USAGE, OR TRADE PRACTICE. (d) OH MY PRINT SOLUTIONS INC. IS NOT RESPONSIBLE FOR ANY DIRECT, INDIRECT, SPECIAL, INCIDENTAL, CONSEQUENTIAL, OR PUNITIVE DAMAGES WHATSOEVER ARISING OUT OF OR IN CONNECTION WITH THE PRODUCTS, YOUR USE OR MISUSE OF THE WEBSITE OR THE SERVICES OR IN RELIANCE ON THE CONTENT AVAILABLE ON THE WEBSITE, INCLUDING WITHOUT LIMITATION ANY BUSINESS INTERRUPTION, LOSS OF USE, LOST DATA, LOST PROFITS, FAILURE TO REALIZE EXPECTED SAVINGS, OR ANY PECUNIARY LOSS, WHETHER IN AN ACTION OF CONTRACT, CIVIL LIABILITY, NEGLIGENCE, OR OTHER TORTIOUS ACTION, EVEN IF OH MY PRINT SOLUTIONS INC. HAS BEEN INFORMED OF THE POSSIBILITY OF SUCH DAMAGES OR SUCH DAMAGES ARE REASONABLY FORESEEABLE. (e) NOTWITHSTANDING ANY OTHER PROVISIONS OF THESE SERVICE TERMS, YOU ACKNOWLEDGE AND AGREES THAT UNDER NO CIRCUMSTANCES SHALL THE AGGREGATE OF OH MY PRINT SOLUTION’S LIABILITY FOR EACH ORDER EXCEED THE LESSER OF (a) CDN$ 100; or (b) FEES ACTUALLY PAID BY YOU FOR SUCH ORDER. Where you submit or provide any comments, suggestions, proposals or other feedback (the “Comments”) to Oh my Print Solutions Inc. in connection with the operation or content of this Website, you irrevocably assign to Oh my Print Solutions Inc. all of your right, title and interest in and to the in the Comments without the right to any compensation or royalties from Oh my Print Solutions Inc. and you waive any moral rights you may have in the Comments. Further, you irrevocably waive and agree never to assert any claims against Oh my Print Solutions Inc. or any of its successors or assigns with respect to the Comments. You agree that Oh my Print Solutions Inc. shall be free to use the Comments on an unrestricted basis. Any dispute relating to the Website or the Services shall be governed by the provincial laws of British Columbia and the federal laws of Canada applicable therein, without reference to any choice of law or conflict of law principles, and without reference to the UNCITRAL Convention on Contracts for the International Sale of Goods or the British Columbia International Sales of Goods Act. You and Oh my Print Solutions Inc. agree to submit to the non-exclusive jurisdiction of the courts of British Columbia, Canada for any and all disputes, claims, and actions arising from or in connection with the Services or these Service Terms. Nothing in these Service Terms shall prevent Oh my Print Solutions Inc. from seeking injunctive or other equitable relief, payment of amounts due, or enforcement of an award before any court having jurisdiction over you over such subject matter. The Website may contain hyper-links to third party websites. Because Oh my Print Solutions Inc. has no control over such sites, access to any other Internet sites linked to the Website is at your own risk and you understand that Oh my Print Solutions Inc. is not responsible for the availability, accuracy or reliability of the contents of any linked site or any link contained in a linked site (“Third Party Content”). Oh my Print Solutions Inc. provides these links to you only as a convenience, and the inclusion of any link does not imply endorsement of any Third Party Content by Oh my Print Solutions Inc. . You further acknowledge and agree that Oh my Print Solutions Inc. shall not be responsible or liable, directly or indirectly, for any damage or loss caused or alleged to be caused by or in connection with the use of or reliance on any Third Party Content. If Oh my Print Solution’s performance of its obligations under these Service Terms is prevented, restricted, or interfered with by reason of: fire, flood, earthquake, explosion or other casualty or accident or act of God; strikes or labour disputes; inability to procure or obtain delivery of power, war or other violence; any law, order proclamation, regulation, ordinance, demand or requirement of any governmental authority; or any other act or condition whatsoever beyond Oh my Print Solution’s reasonable control, including, without limitation, any telecommunication services or any other services provided by a third party, Oh my Print Solutions Inc. shall be excused from such performance to the extent of such prevention, restriction or interference. Oh my Print Solutions Inc. will take reasonable steps to avoid or remove such cause of non-performance and shall resume performance hereunder with dispatch whenever such causes are removed.